Do not over load the aerial scissor lift. 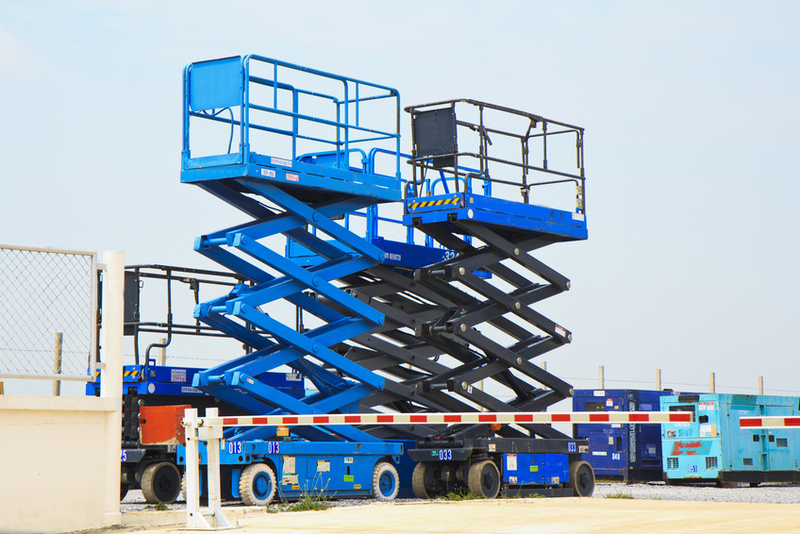 There is a limit to how much weight a scissor lift can safely. When renting equipment like this, find out what limit is and keep to it. Whenever you raise people you run the risk that someone will fall off. As you raise the lift the weight does make a difference because the base becomes less stable as you get higher up. Other factors, such as wind can also be a factor when you have a raised platform outside. The more weight you add, the greater the risk of accidents such as having the entire unit fall over with a gust of strong wind. Take your time using the scissor lift. When you are renting equipment, there may be the tendency to want to rush your job but when you are going to transfer materials to higher elevations, you should take your time with the project. You should always proceed with caution when using any kind of heavy equipment. This is especially crucial when working with aerial lifts. Make smart use of lanyards. Workers on aerial lifts often use lanyards as a safety feature. Basically workers wear them and they attach to the scissor lift equipment. If anything should happen to that worker, the disconnection will shut off the machine. Be smart about their use. Workers should make sure their lanyards are not overlapping as this severely compromises the safety feature of the lanyard. Stay within the guard rails. At no point should any of the workers real over the rails or stand on them. The manufacturer had a reason for putting the guard rails on the scissor lift and is to protect the people using it. This is basic aerial lift safety. If you have to reach over to do something, do so with extreme caution. It is much easier to fall off of the scissor lift than you might think. Every year people watching sporting events fall out and are injured or worse. If you are thinking about renting equipment like this for this kind of thing, you should revisit that plan. If you need to go higher, go higher but do not ever stand on the guard rails. to go higher to perform a task it is better to raise up the platform itself rather than stand on the guard rails. Never move the platform when it is extended. You might find you have to move the scissor lift during a job. You should lower it before moving as it is already unstable when extended and moving it just invites disaster. When renting equipment like this it is important to be very cautious when you move it. This holds true for al l heavy equipment. It is very easy to be injured when moving a scissor lift. Make sure you close the doors before you move it as well. They can bump into other things and cause damage. Scissor lifts can be very useful tools and allow a lot of jobs to be done that would not be otherwise possible. When renting equipment such as this, you should make sure you get all of the factory safety information about it. Different companies may offer kinds of equipment rentals and different options to fit whatever your construction needs may be.